If you have not noticed, Learn360 looks a little different. They have made some improvements to the way the site looks and feels. As you login, there is a front screen that tells you about the new look and new features. This week's tech tip is about managing and creating playlist. When you find a great video, you don't have to bookmark it, you can actually create a playlist and keep adding media to that playlist. It will always be there when you log into Learn360. 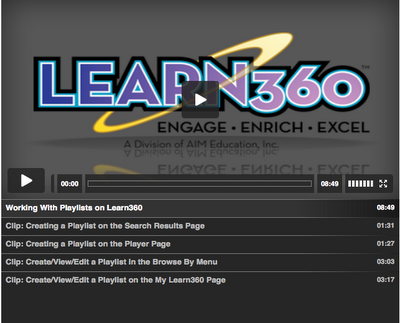 So, here are some short video tutorials about managing and creating playlist with Learn360.